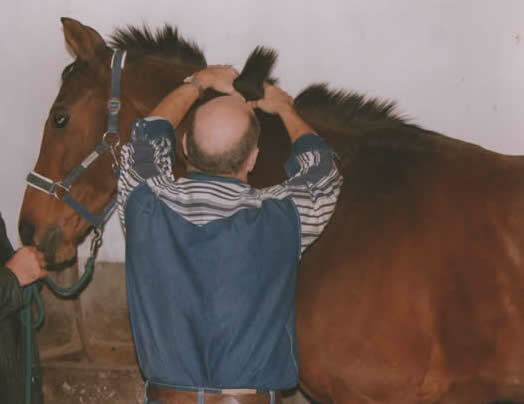 As Jock (John) Ruddock, the pioneer and founder of ET, said: “Equine Touch was just something that just happened, and evolved to where it now is in the equine world simply because it works”. In 1996 he had begun to develop and practice an holistic body address which worked on the principle of vibrating the soft tissue of the human by performing an Aikido based move over specific points on the body. The results of this technique, which he later called the Vibromuscular Harmonization Technique (VHT) were astounding and shortly after he began to teach it to bodyworkers the inevitable question was asked ‘ Will this work on Horses?’ As a result, on one Saturday morning late 1997 he travelled, to a stable in Aberdeen to show one of his students where he thought she could do the VHT moves on a horse. Such was the result that he was invited back the following Saturday to work on ten horses, and so it began. One year later he was working on the Czech Steeplechase Champion, Cipisek, and three months after that was teaching his ‘no name’ equine bodywork to interested vets from all over Europe. They were so enthusiastic about this technique that a few months later he was invited back to teach an advanced clinic as well as teach another foundation class to vets. On this second clinic he met a young vet, who was interested in horses and small animals and had knowledge of animal anatomy. Jock invited her to join him to learn more about his techniques as well as to help him to correct and ‘upgrade’ his manuals. In 1999 Ivana left her home in Czech Republic, later married Jock and joined him in his teaching travels around the world. Their aim, to improve the life of horses by educating humans, in what is now known as The Equine Touch. Jock was the intuitive bodyworker and Ivana with her knowledge translated his intuition into fact, giving it form and putting it into an educational format. Their Equine Touch evolved into a comprehensive system, a bodywork educational program offering students not only practical skills but also the theory to better understand the influential factors affecting the horses body and mind. The main focus is still on teaching the foundation class to horse owners enabling them to give their mounts a better quality of pain free life, at a price everyone can afford. The Equine Touch Foundation now has four different levels of expertise that a horse loving student can attain. There is also a professional practitioner track to allow the career minded to go out and work on other peoples horses. Jock and Ivana’s teaching load was alleviated with the training of 20 instructors who take students through Level 1 and Level 2 before handing them back to Equine Touch Foundation to take them through Level 3 and Level 4. After accomplishing all the requirements these students on the Practitioner’s track may graduate as a qualified Equine Touch Practitioner. After Jock’s passing, Ivana continues to teach her L3 and L4 ET classes, as well as the Whole Horse Dissection, a class that can be looked upon as an ongoing professional support for the ET students and practitioners.